You've tried growing indoor plants but have experienced limited success. No matter where you live, it is nearly impossible to achieve perfect growing conditions throughout the year. For indoor gardeners, a T5 fixture might be the ideal solution to remedy previous failures. Indoor crops need sufficient lighting to thrive. Traditional light bulbs don't promote plant growth. Fluorescent lighting may be the solution to turn misfortune into success for indoor planting. T5 bulbs seem to fill a void in the grow light industry where traditional T8 and T12 fluorescent bulbs have failed. Many people want to grow herbs, plants, and crops year-round. In some regions, natural lighting isn't adequate. Also, excessive rain or poor growing conditions limit the success of outdoor gardening in some areas. The solution to this issue is to use indoor grow lights to enhance indoor plants. Grow lights mimic natural, outdoor sunlight. This allows an indoor gardener to cultivate a garden successfully, no matter where they live. Grow lights using T5 bulbs create almost perfect growing conditions for individual plants. While some crops and plants require direct sunlight, others require lighting from an angle. Some plants or crops grow best if they are under high-light settings for only a portion of the day. With outdoor crops and plants, there is no control over light/dark conditions. Grow lights allow a gardener the ability to control lighting conditions. A T5 fixture is a fluorescent light fixture that is fast becoming a favorite for gardening in an indoor setting. T5 fixtures come in various lengths, to support from one to four bulbs. Grow lights work using a specific light spectrum to promote vegetative growth, and the T5 bulbs fit this use very well. Fluorescent lighting is possible because of a chemical process. Gases and mercury vapor interact to produce powerful UV-lighting. The process results in a "white light" inside of the bulbs, rather than the subdued lighting traditional light bulbs emit. The ballast controls the fluorescent bulbs. Bulbs contain inert gases, the ballast generates a low amount of heat, which causes the gases to react. The reaction produces light. The ballast also stabilizes the bulb and controls output. Fluorescent lights won't damage crops and plants and they are more energy efficient than traditional lighting options. Before selecting a fluorescent fixture, it is important to compare several models. Indoor growers should understand the lumen and power output, and how to set up their lights. There are a few factors you should consider when choosing a T5 fixture for indoor gardening. Most T5 fixtures can be mounted horizontally or vertically, increasing their versatility. Most fixtures are available in 2-foot up to 8-foot-long frames. If you are in a small apartment, a single-bulb, 2-foot-long fixture might be perfect. However, if you have plenty of room, you might choose a more prominent fixture. The size of the coverage area determines the size of fixture needed. The vegetables and plants you're growing also impact lighting decisions. Overly powerful fixtures emit higher reflection levels which might kill plants. 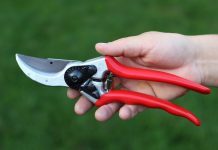 Likewise, a fixture without enough power will limit a garden's potential. Understanding how the lighting will affect your specific plants will aid in decision making. T5 lights are best for getting seedlings to begin to grow. The T5 bulb is a blue spectrum light so that it can support plants through the initial vegetative process. Older plants might require more advanced spectrum lighting for maximum indoor growth. There are positives and negatives associated with using T5 bulbs for indoor growing. It is essential to understand how they operate for maximum results. Our T5 fixture review considered several factors. The price of the fixture, lamp quality, temperature rating, and space requirements were some relevant factors. Our analysis also employs user ratings by owners who use T5 lights. Before choosing T5 grow lights, gardeners should compare several products. We've done the homework for you and compiled a list of some of them. 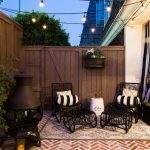 Following are the fixtures that provide the best lighting for any indoor garden ventures. Available in 2-foot or 4-foot length you can find the perfect fixture for the growth area you're working. It includes a 10-foot grounded power cord, allowing you to set up your light fixture quickly. The fixture comes standard with a set of four 6400K T5 bulbs. The steel casing frame is powder-coated for durability. These fixtures emit up to 20,000 lumens for robust, efficient growth production. Some owners complain the bulbs burn out quickly, meaning frequent replacement and extra cost. There were also complaints that the fixture does not distribute light equally. This causes different growth zones to receive varying amounts of light resulting in uneven growth. 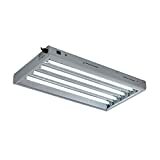 The overall rating for this T5 fixture is 4.2 out of 5-stars on Amazon. The 2-foot-long, T5 fixture features a 15-foot power cord that allows greater versatility in an indoor setting. It also comes with bulbs which emit 6500K light over the growth base. The light tubes remain cool to the touch. The set contains four banks of lighting, for even distribution throughout the growth area. You can use this fixture vertically or horizontally. Some owners complain that the set is not as sturdy as heavier T5 fixture models. Uneven weight distribution causes shifting or movement, which may hinder growth and production. Owners rate the fixture 4.4 out of 5-stars on Amazon. This 4-foot long fixture is easy to set up. The included bulbs distribute 6400K light. At 54-watts each bulb, even light distribution is achieved throughout the entire growth period. The light set emits 20,000 lumens, and the reflector returns up to 95% of the light onto your plants and herbs. A daisy-chain plug is easy to turn on/off making this model an energy saver. Some purchasers complain the fixture isn't sturdy and that lights bulbs can easily shatter. Additionally, some complain that when the first light goes out, the third bulb also burns out with it. 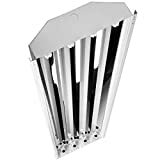 This T5 fixture has a rating of 3.8 out of 5-stars on Amazon. This 2-feet fixture is perfect for a small growth bed setting. The T5 fixture has dual switches allowing the use of two light tubes. The strip-light design is slim and doesn't take up much space. In small areas, this is the perfect size bulb set to purchase. It is lightweight and easy to install. Some owners claim they previously owned the older model of this fixture which was more efficient. Some also complain it has a short life-span and only registers 300-400 on light meters. In comparison to other bulbs emitting up to 2500 lumens, this is a very weak emission power rating. Amazon purchasers rate this fixture 3.8 out of 5-stars. The 2-foot-long fixture features four bulbs with a high 95 percent reflector rating. The maximum light output is possible when utilizing this growth light in an indoor setting. Each of the lamps emits 6400K, and the wattage of the bulbs is 24-watts. An eight-foot-long, 120V power cord makes it easy to set this fixture up anywhere. The set is rated 5000 lumens per bulb. Some purchasers complain about the quality. They note it can easily dent or bend if it hits a hard surface, so you have to be gentle with the light fixture. Some purchasers also stated that the bulbs burn out quickly. 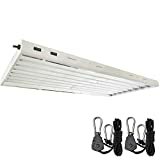 This T5 fixture has a 3.6 out of 5-star Amazon rating. This product works on 120 - 277V power plugs, allowing you to use it in the US or UK. Warehouse-grade lighting achieves maximum light quality with a 95% reflection rating. The metallic body is durable and isn't prone to easily getting damaged like other fixtures. It is built to withstand dust and corrosion with the powder-coated finish. 4 Lamp T5 Linear Fluorescent High Bay F54 T5 High Output Warehouse Lighting. Achieve maximum light quality with 95% reflection using Vega-95 Technology. Bulbs do not come with the fixture so you will incur an additional cost purchasing this T5 fixture. You also have to note the difference between the UK and US-version for the right bulb size fit. 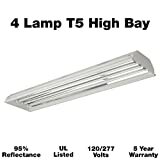 Owners of this T5 fixture rate it 4 out of 5-stars on Amazon. 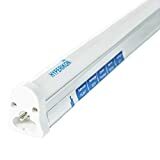 The 4-foot-long, four-bulb fixture is suitable for most interior growth areas. This unit does not ship with a power cord. An access plate makes attaching a power cord and installing the bulbs quick and easy. Assembly of this fixture shouldn't take more than a few minutes. This unit also does not ship with bulbs. It works with efficient fluorescent bulbs which allow the unit to emit high levels of light. The fixture features a 95% reflection rating as well. Some owners complain that efficient-rating bulbs tend to burn out faster. On Amazon, this fixture has a 4.2 out of 5-star rating. This fixture features a single-bulb setting. Bulbs are integrated into the fixture and are not replaceable. The bulb emits up to 5000K bulbs and 2200 lumen output ensure even light distribution when the fixture is on. The LED light is energy-efficient, so doesn't require much energy to operate. LED lighting can reduce your energy bills, while still producing bright light over the growth area. You receive a 5-year hassle free warranty with the light fixture also. It is a single-bulb set, making it perfect for smaller growing areas. Several people who bought this light set also indicate that it did not come with a power cord. Results of using white LED for grow lights are inconclusive, but growers using it seem to like it. Owners of this fixture rate it 4.7 out of 5-stars. The 4-foot-long growth light fixture features a high-output 6500K bulb set, perfect for vegetative growth. There are multiple hanging options and a long power cord. The fixture works well installed vertically or horizontally. This fixture carries a 1-year ballast warranty and 2-year fixture warranty. Bulbs ship with this fixture. Some purchasers claim the fixture is extremely heavy and awkward to put together. The casing finish is prone to denting or damage if you aren't gentle when installing it. This fixture has a 3.3 out of 5-star rating on Amazon. This fixture is 4-feet long, with a powder-coated finish making it a sturdy light fixture for any indoor setting. It ships complete, including four 6500K fluorescent bulbs. At 10,000 lumens, with a 95% reflection rating, nearly all the light is directly reflected on the plants or herbs. There are two switches on the body for flexible lighting options when growing plants and herbs. In comparison to other fixtures, this one only emits 10,000 versus 20,000 lumens. Some purchasers complain of performance quality, and that the set burns out quickly after installing new bulbs. This fixture has a 4.1 out of 5-star Amazon rating. These T5 fixtures range between $40 on the lower end and $120 for the highest priced model. Numerous suppliers carry the products. In addition to ordering from the manufacturer directly, they are also available on Amazon. We believe the Hyperikon T5 Fixture Single Light is an excellent option for smaller indoor gardens. It has only one bulb, allowing you to pinpoint your lighting in a specific area quickly. And, emitting up to 2200 lumen output guarantees even light distribution throughout. The fixture is lightweight, easy to install, and isn't prone to damage as quickly as others. For those growing on a larger scale indoors, an Oppolite T5 fixture is a great option. It operates on 6500K bulbs and achieves temperatures of up to 102 degrees Fahrenheit. 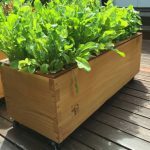 The 15-foot-long power cord also gives you flexibility in choosing the growing area. It is easy to set up, and bulbs tend to last longer than competitor models. Miracle-Gro Fertilizer Gardening Review: Does It Live up to the Hype?